At the vanguard of this field, Zab Maboungou/Compagnie Danse Nyata Nyata highlights the potential, both in terms of research and artistic creation, of a coordinated approach to rhythmcultures, enriched, among other things, by the multiple African sources that thread through and nourish them abundantly. In this spirit, the “Not Just Dance” symposium is an initiative aimed at generating a broader understanding of the contexts and issues encompassed within the realities of political and aesthetic cultures, an initiative that we hope can be extended to various regions of the world, with the collaboration of various local artists and communities; in other words, that we hope will be an “itinerant” symposium. Various topics and discussions are planned for this event: Life and archives. Stories, transmission and circulation. Gesture and orality. Space and being. Techniques and teaching. Thought and freedom. Rhythmcultures set in motion, develop and perpetuate ways of understanding (knowledge and spirituality) and appreciating (aesthetics) life through time: rhythms, in fact, actuate and incorporate cultural realities in the form of archived notations of life, time and space, within communities. These rhythmcultures, veritable mobile institutions, live and evolve in and through song, dance, music (the foundation), poetry, literature, the visual arts, theatre, ritual, divination, therapeutics, politics, rhetoric, and so on. For the recipients of rhythmcultures, the issues are multiple, attached to various territories and communities, to various imaginary and aesthetic forms; they call out and respond to each other, thus creating novel conditions of freedom. Initiatory pathways of spirit and freedom; of strength and intelligence: African rhythmcultures – heritages and new worlds. Active history and forgotten history, living memories and contemporaneity, dance is a primordial history at the centre of worlds. Dance is not just dance: an open dialogue with these histories and the gestures and bodies that carry them, disfigure and re-configure them through the issues given shape as they are ceaselessly taken up and renewed. 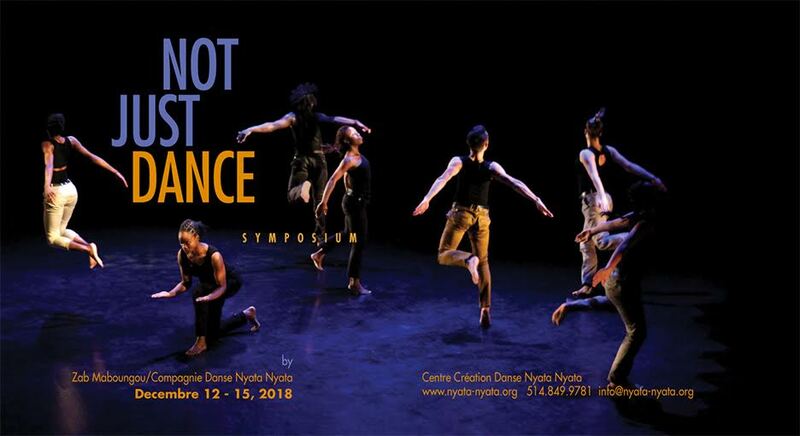 The “Not Just Dance” symposium is for artists, thinkers, critics, observers and amateurs for whom the art of dance remains an art for future centuries, whose true concerns, messengers of meaning, are at the heart of life, lived and to be lived. The “Not Just Dance” symposium aims to open perspective on a new dynamic for taking up both the aesthetic and intellectual challenges represented by the art of dance inherited from and inspired by rhythmcultural traditions of dance and music, including, in particular, those originating from Sub-Saharan Africa. For this symposium, the art of dance will be a host in its own image: at once free and inviting, engaging and seeking, moving from gesture to word and creating in situ, opportunity and reflection, dialogue and an encounter, halfway between a history to be revisited and a future to be invented. For each of the avenues explored below, a four-part dialogic process is planned: presenting the topic (A), discussion (B), workshop (C), and artistic presentation (D).